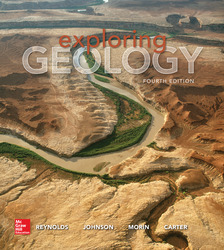 Exploring Geology by Reynolds/Johnson/ Morin/Carter is an innovative textbook intended for an introductory college geology course, such as Physical Geology. This ground-breaking, visually spectacular book was designed from cognitive and educational research on how students think, learn, and study. Nearly all information in the book is built around 2,600 photographs and stunning illustrations, rather than being in long blocks of text that are not articulated with figures. Connect: A highly reliable, easy-to-use homework and learning management solution that embeds learning science and award-winning adaptive tools to improve student results. SmartBook is the first and only adaptive reading experience. Fueled by LearnSmart – the most widely used and intelligent adaptive learning technology – SmartBook identifies what you know and don’t know, and highlights what you need to learn at the moment that is most impactful for you. SmartBook now comes with additional learning resources (video clips, presentations, animations, etc.) which help you to conceptualize and engage with the content in a more focused manner. For Connect® users, the ReadAnywhere App is a free, downloadable app available on iOS and Android mobile devices. It gives students mobile freedom to access their eBook anywhere, even offline, on their smartphone or tablet. Once chapters are downloaded, students can use the same tools that are available in the eBook. Any notes or highlights they make in the eBook will sync across platforms. Visit https://www.mheducation.com/highered/explore/readanywhere.html for more information. The design of the text consists of a series of two-page spreads. Each spread is designed to concisely convey the important aspects of a geological concept or system. The two-page spread design was greatly influenced by educational and cognitive research on how people learn. This text uses figures and illustrations as the focus for understanding geologic processes. The 2-page spreads feature numerous photos and diagrams. A typical text is written to explain geologic process through facts and theory. The Reynolds team developed their content based on "what students need to know" (learning objectives) and then created the necessary visuals and wrote the presentation around the visuals. The text has been designed to encourage inquiry and provide readers with tools to think critically about geologic problems. Questions in the title, opening paragraph and topic headings are intended to get readers to think about the topic and become interested and motivated to explore the two-page spread for answers. The authors also use a learning-cycle approach in presenting topics. This approach includes three phases – exploration, introduction of terms and concepts, and connection. Chapter Opening two page spreads are generally organized around one large, central figure, such as a map, satellite image, or conceptual diagram. Most involve a specific geographic locality to immediately convey that the information in the chapter applies to real world settings. Topical two page spreads are the foundation of the book. They have one or more main illustration linked to text boxes. Each chapter concludes with a 2-page spread titled Connection that is similar to a case study and describes an actual geologic location with the goal of showing how the chapter topics are connected (tied) together. Each chapter ends with an "Investigation" two-page spread. In these exercises, readers must apply knowledge, skills, and approaches learned in the chapter. At the bottom of each two-page spread is a key element titled "Before You Leave this Page..." which serves several important purposes: a) to assign activities that reinforce the key concepts; b) to assure that students understand key concepts before reading the next module; and c) to answer the question "What will be on the exam." The instructor supplements are superior to any competing text with high-resolution PowerPoint images and the supporting Notes to assist in using the images for course presentation. Many slides also include 3-D images that can be rotated vertically and horizontally. NO other text can match these presentation tools. Stephen J. Reynolds received a B.A. from the University of Texas at El Paso, and an M.S. and a Ph.D. in geosciences from the University of Arizona. Dr. Reynolds is a professor in the School of Earth and Space Exploration at Arizona State University, where he has taught regional geology, earth resources, evolution of landscapes, field studies, and teaching methods. He has directed the geologic framework and mapping program of the Arizona Geological Survey, completing a new Geologic Map of Arizona. As a National Association of Geoscience Teachers distinguished speaker, he has traveled across the country presenting talks and workshops on how to infuse active learning and inquiry into large introductory geology classes. He is a commonly invited speaker to national workshops and symposia on active learning, visualization, and teaching. Dr. Reynolds is the author of the highly successful Exploring Geology. Julia K. Johnson earned an M.S. and Ph.D. in structural geology and geoscience education. Dr. Johnson is a full-time faculty member in the School of Earth and Space Exploration at Arizona State University (ASU), where she teaches Introduction to Geology to nearly 1,000 students a year and supervises the associated introductory geology labs. She also coordinates the introductory geology teaching efforts of the School of Earth and Space Exploration, helping other instructors incorporate active learning and inquiry into large lecture classes. The main focus of her geoscience education research is on student- and instructor-generated sketches for learning, teaching, and assessment in college geology classes. Before coming to ASU, she conducted groundwater studies of copper deposits and taught full time in the Maricopa County Community College District, teaching physical geology and environmental geology.